I've had a longstanding interest working with children. In 1998 I completed certification as a special needs child care worker and the following year completed advanced Early Childhood Education training. That same year I taught a Safety Kids program before working in child care for the Developmental Disabilities Association for several years. As the mother of a child with special learning needs, I know how valuable support and resources are for kids and families who need extra help. It is my personal mission to become the best child advocate I can be. I love helping people and working with families who need support. In addition to working in the field of child support for ten years now, I also contribute to parentingbc.com as author of Carrie's Corner, and I participate in the annual ChildRun fundraiser for kids living with cancer. At this point in my life I have lots of experience and knowledge that I want to continue to use in the field of child development. However, I also have Juvenile Rheumatoid Arthritis, a degenerative disability that causes serious physical restrictions and prevents me from doing "floor work" all day that is so common in child care centres. A few years ago I started to experience a persistent increase in limitations from my arthritis, so I attempted to change my occupation to that of a Supported Child Development Consultant. I wanted to increase the administrative and planning involved with supported child care while also reducing the "hands-on" physical demands. I interviewed for a number of these positions, but kept getting feedback that I lacked specific training - a diploma in Supported Child Development - for this job. As a single parent at the time, it was scary to think about going back to school because of the high cost of living in the Lower Mainland - it has been one of the biggest barriers to my career advancement. I accessed provincial vocational services and my case manager referred me to the Opportunities Fund program for a cost-sharing arrangement. Specifically I needed living supports while I was in school as I didn't qualify otherwise for any other source of income support. These provincial and federal programs seem to work well together; the process of qualifying for support was relatively easy and straight forward. I completed the Infant Development and Supported Child Care program at UBC within a year and maintained an "A" average. 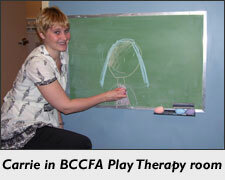 Within six months of my graduation from UBC I secured a position as a Supported Child Care worker at the BC Centre for Ability. I'm really grateful for the opportunity this program's given me to stay in a field that I love and to continue to contribute my talents to it.